Produced by Marshall Herskovitz, Scott Winant and Edward Zwick. Copyright © A Bedford Falls Company production in cooperation with ABC Productions for ABC Network 1994/95. "My So-Called Life" © 1994 a.k.a. Productions, Inc., a subsidiary of ABC Productions, a Walt Disney Company. Original music by W.G. Snuffy Walden. Directed by: Victor Du Bois, Michael Engler, Marshall Herskovitz, Todd Holland, Elodie Keene, Ron Lagomarsino, Patrick R. Norris, Jeffrey S. Perry, Mark Piznarski, Ellen S. Pressman, Mark Rosner, Claudia Weill, Scott Winant, Edward Zwick. 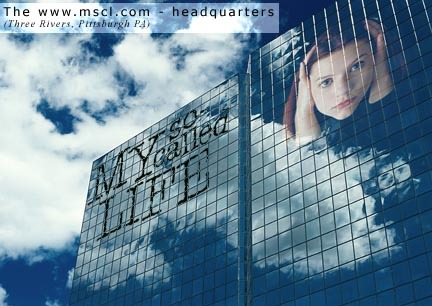 MSCL.com operates the world's largest web site about the television drama, "My So-Called Life." Founded in 1997, MSCL.com is dedicated to sustaining and supporting new and existing viewer-enthusiasts of "My So-Called Life." The site's seven principal members and operators reside in Austria, Germany, and the United States. MSCL.com is not-for-profit, is advertising free, and is not affiliated with the Bedford Falls Company, or cast or crew of "My So-Called Life." The information contained within this web site was compiled with the help of thousands of MSCL enthusiasts and insiders over many years. Thanks go to the members of the mailing list "Liberty" (especially Virany Kreng for the FAQ, Kory Lasker for the very first MSCL homepage, and Misty Jones for the soundtrack information), the maintainers of the so-called "MSCL Bible," the maintainers of countless MSCL web sites all over the Internet, to ABC, and, of course, to the Bedford Falls Company and the cast and crew of "My So-Called Life." This website currently uses icons from the famfamfam silk icon set.